While living in Australia, there was an area of reclaimed land called the Docklands. It was considered an up and coming area full of new condos, restaurants and bars. When we checked it out, however, it seemed a bit devoid of life. After an initial visit in the first week of our stay down under, and one other visit there to watch a Footy match, we never set foot in the area again. 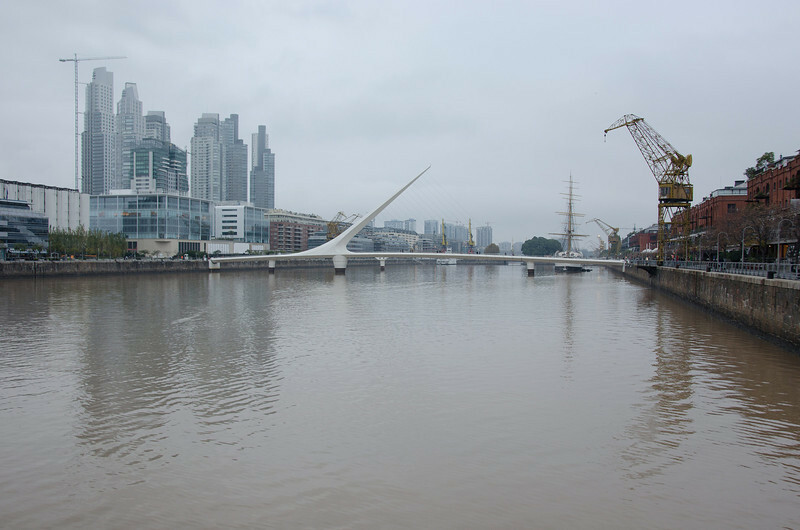 We heard a similar song and dance about the Puerto Madera, a reclaimed area of Buenos Aires which used to be a shipyard and is now chock full of…you guessed it, condos, and restaurants (not to mention a shockingly similar muddy brown river…The Yarra of Buenos Aires, perhaps?). There is a cool bridge, tons of outdoor seating and even a Casino. Now, here’s where we want to be careful with judgment because, in all reality, the weather was crap. Absolute crap. Perhaps it was the rain, the cloud cover, the slightly chilly temperatures that kept the hoards of people and liveliness away…it definitely kept our spirits subdued. But, perhaps, it was that reclaimed areas are just that. Reclaimed…because no one wanted them before and people are slow to flock back. 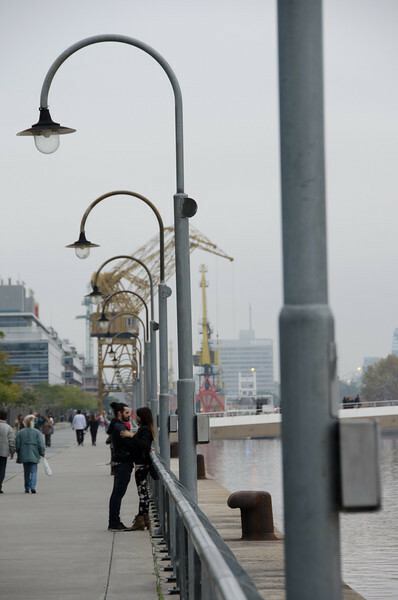 Particularly when so many other attractions in Buenos Aires proper are at your finger tips. 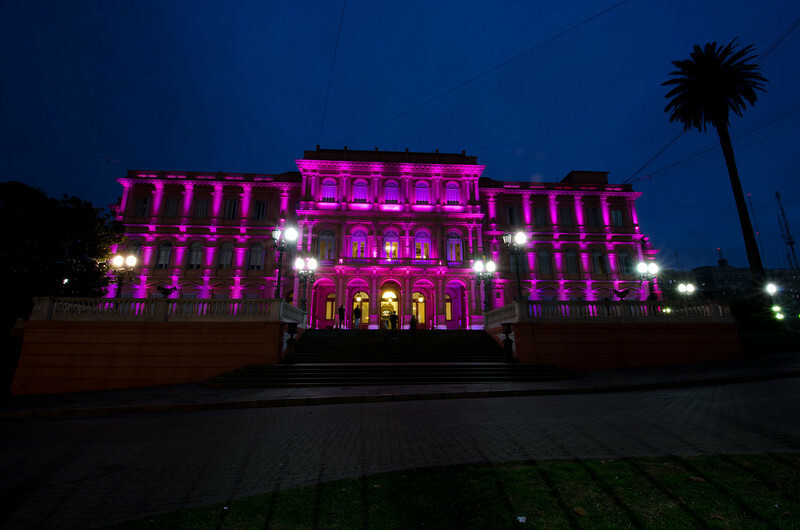 One good thing about this side trip is an unexpected run in with the Casa Rosada – Buenos Aires’ famous government building known as the “Pink House” where, if you’re familiar with your Evita/Hollywood history, Eva Peron addresses the protesting Argentinian people. The beautiful pink hue of the house was positively glowing in the last glimpses of daylight before being lit up by neon pink spot lights. I guess no one wanted you to have to doubt whether or not you were staring at the iconic Pink House. At this point of our day (still only our second) we had been walking pretty non-stop for hours on end. From our neck of the woods, to Recoleta, through a market, down to the Puerto Madero, around the house of questionable color (it’s pink, remember? ), and through the grassy avenue behind it. We were exhuasted and both of our feet were screaming at us to take one of the cheap, overly abundant taxis. Dinner that evening was cooked in, complete with a bottle of vino whose name was a shout out to our Sunday plans: San Telmo.